This kitbash is based on the loose parts I bought from the DAM Alpha figure, along with some other extra pieces that I bought to go with this figure. 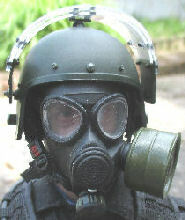 The main part I wanted to use was the KGB Hobby gas mask, along with the helmet and visor from the DAM Vityaz figure. 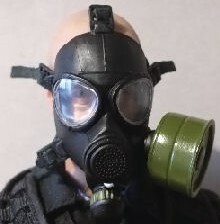 Because I wanted to use the KGB Hobby gas mask, I have had to use the DiD Hermann Hanke headsculpt as well as I have had to make a new harness to the mask itself - KGB Hobby gas mask alterations. 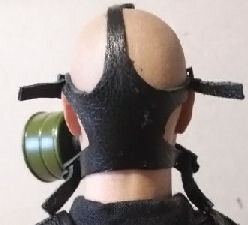 The headsculpt I have used which helps to fit the gas mask better as it is bald. I tried other heads, but I found a lot of the problems I was having, was because of the hair line which caused the mask to sit wrong. The body I am using for this kitbash is in Picture 5. and this was made by COOMODEL as a 27cm taller body. 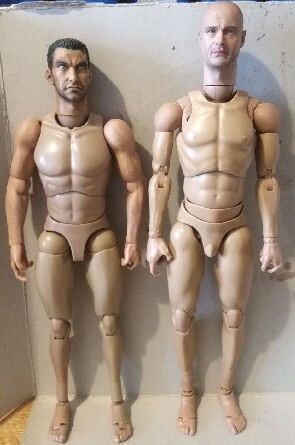 Next to it is another normal height body I bought to use with a future kitbash, this one was made by ZC Toys which is a muscular type of body. The COOMODEL neck ball allowed me to plug in the DiD Hermann Hanke head and adapter, with no additional alterations. Which has also added to the overall extra height that this figure has. I also found that with this body, it has some extra ankle pieces in place, to make the whole figure look taller to 27cm when measured from the feet to the bottom of the neck joint. Picture 6. shows the ZC body in the Alpha uniform, as well as the height differences it shows just how much more bulky the body will be. 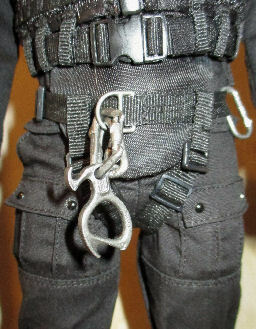 Picture 7. shows the COOMODEL body with the extra ankle pieces removed, so that the body can be reduced to the same height as the ZC body. 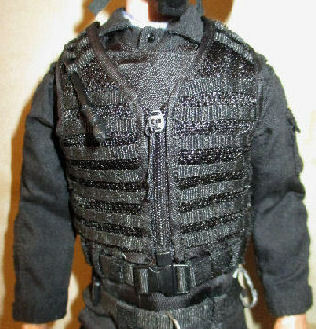 The black uniform I have used here is from the DAM Saturn figure, this is then combined with some of the DAM Alpha pieces like the assault vest in Picture 8. 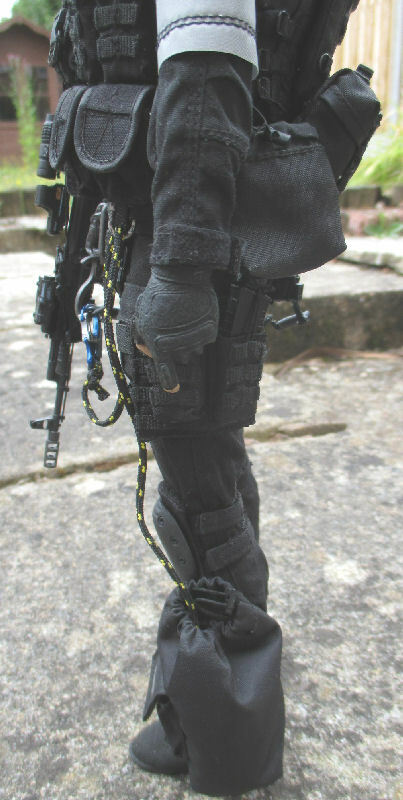 On the right are the DAM Vympel boots that I have used with my kitbash, I have replaced the laces that the boots came with. With some thinner and more in scale thread, but in the process of doing this some of the eyelets broke on me as shown in the picture on the right, where I have had to make a new stud to hold the 4th eyelet in place. This will be repainted with some black paint to match the other studs. 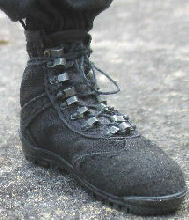 Dam Laces. 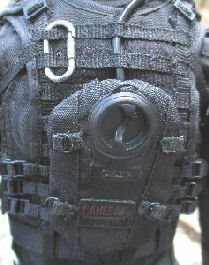 The black pouches that I am going to use with this kitbash, have mainly came from the Dam Alpha figure. 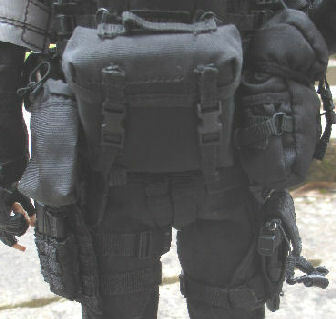 I have obtained some smaller additional black pouches for the belt and the vest. 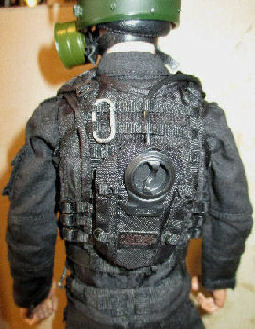 I have also added a large black gas mask pouch on the belt, I am unsure what figure it came from. 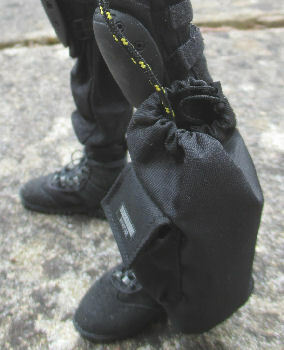 I also added a black leg rope bag which I believe it was made by Soldier Story. I have assembled the basic figure so far with the pieces such as the uniform, knee pads, helmet, gas mask and the �C� hydro pouch. And in the pictures below as usual with me, I try to get away from the plain toy like boxed figure. So, I have given the whole figure a very light drybrush of some of the weathering powders I have, to bring out the detail and to also lose the new look of it. I very lightly used the Tamiya Light Sand weathering powder on the whole uniform, as it helps to bring out the top of the material creases. 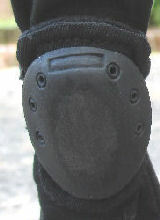 Picture 11. is one of weathered boots which have brought out the boot seams and laces, Picture 12. is one of the pair of knee pads, that I have first repainted with some mixed Black and Grey acrylic paint, that I have also sanded in the centre to simulate wear. 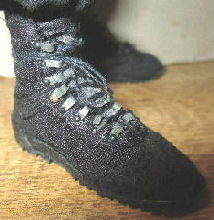 Which then also got a light brush over with the weathering powder. Picture 13. is the hydro pouch in place, which has also had the light covering of the powder, again to try to help bring out the detail. Picture 14. & the picture on the right, shows how I have first used the Tamiya Black weathering powder, to lose the glossy look of the rubber parts of the mask. Because to me the helmet looked too new as shown on the right, I have taken off the glass visor and then put the helmet into a bag with some screws and gave it a good shake. 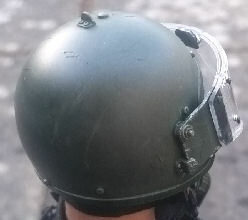 But I found that I did not mark the helmet enough for me, so in the other picture I have used a 3mm drill bit to stab at the helmet, which has left the marks as shown. This has now scratched the paint and given it a more worn look, I then gave it a light rub over with some Silver weathering powders, to highlight the scratches. I then gave the whole helmet a drybrush of a Green weathering powder to dull the helmet colour. Picture 15. 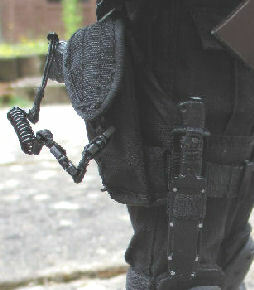 & 16. shows the rope leg bag that I have fitted to the figure, to go with the waist tactical rappelling harness. Picture 17. shows some of the pouches that I have attached to the vest, also a blood group patch. 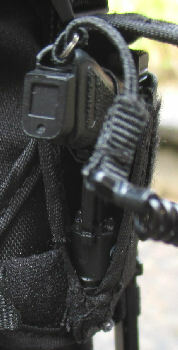 Picture 18. shows the pistol and holster, onto which I have sewn the knife onto the side of the holster and leg strap. 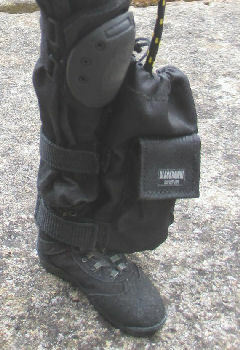 Picture 19. shows the lower triple grenade pouch, with above that a pair of magazine pouches and a small utility pouch. 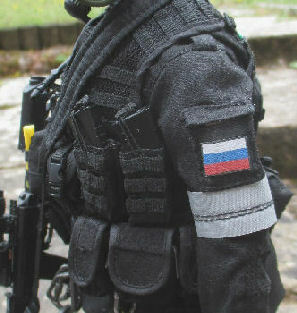 On the figure's arm is a reflective armband along with a Russian flag patch, the front blood group patch which along with the larger patch on the back of the figure. 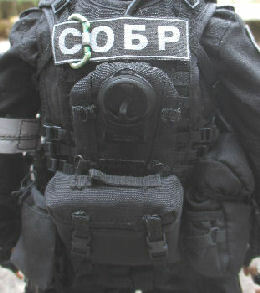 That I bought from One Sixth Scale King. On the back of the figure in Picture 20. I have the DAM Alpha �C� hydro pouch, below that is a large equipment pack, to the left is a DAM dump pouch for spent magazines. 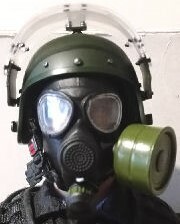 To the right is a large Black gas mask pouch, I have taken a lot of the filling out of it, So it still looks bulky, but it is supposed to be empty as the figure is wearing the gas mask. 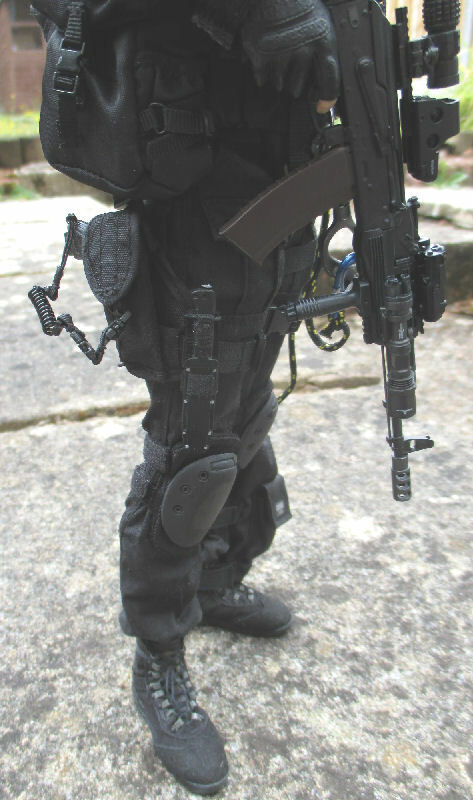 In the picture on the right, I have on the left leg another two magazine pouches, the pistol and holster on the right leg, and a better picture of the large equipment pack and gas mask bag. 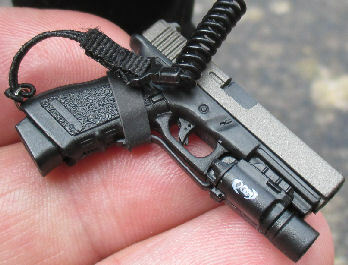 Picture 21. shows the DAM G17 Pistol that I bought loose, to go with I think the DAM Alpha holster. To get the pistol to fit the holster, I had to cut the bottom of the holster as shown in Picture 22. And then I fitted the pistol back in place with the torch fitted, and I then sewed the holster back together around the bottom of the pistol to make sure that it could keep the weapon in place. The picture on the right shows the DAM Alpha AK-74M assault rifle that I bought loose, which was given a light drybrush of the Gunmetal and Light Sand weathering powders. 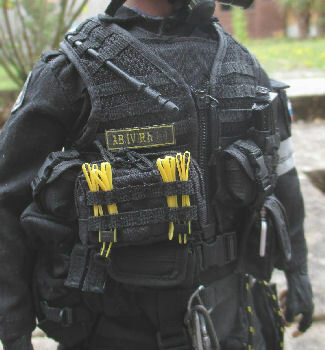 Thank you to Wesley and Scimitar Mcmlxv for all of the help I have had with my Spetsnaz figures. And to One Sixth Scale King for making the large back patch for me.